Hello fashion lovies! How are you enjoying the month of June so far? Well for me, it’s alright. Just awaiting new adventures and opportunities for work. Otherwise, let’s talk about this look right here. So if you know me, you know my main style is luxe/classic with some edginess. This time, I decided to go with a sporty luxe style for my look. Starting with a white t-shirt with a Daily Front Row graphic layered with a navy blue blazer paired with brush-stroked (probably not really brush-stroked) pencil pants. I wanted to break up two solid palettes with a good graphic detailing. ! The relaxed feel of the graphic pants gets another layer of cool bright, white kicks. Fashion sneakers topped with any ankle-grazing graphic pants or denim turns street-wear into street-style. I kept the classic and chic elements with a dressy metallic clutch and topped it off with a pair of cool aviators shades. Last but not least, the statement necklace elevated my look just a bit further, for a chic finish. 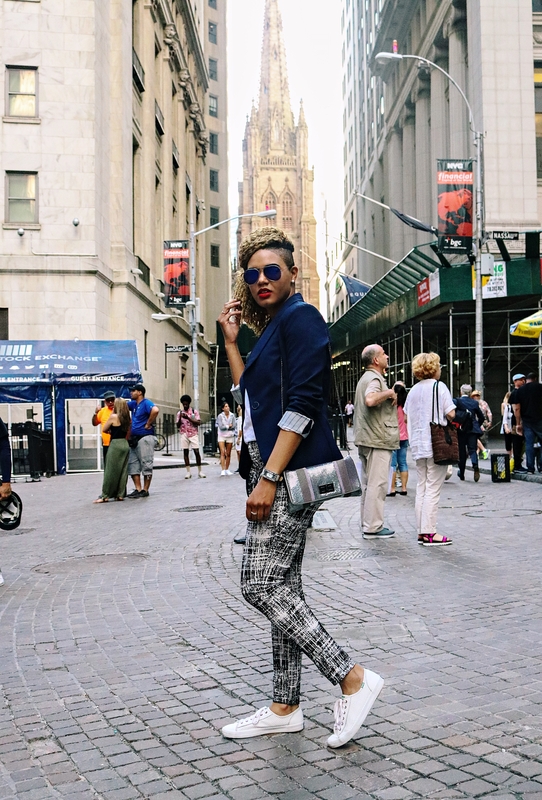 So this is how you do a sporty luxe on Wall Street. Yea! I would love to know your thoughts. What did you think of this look and what kinds of styles do you like to fuse? Thank you for reading and Happy Styling!